1. Going for work without having breakfast: It hampers your brain’s function seriously. Your brain needs glucose which is the food for it. If you do not eat breakfast and go to work, your brain will not get the fuel for working. Ultimately, it will suffer from some fatal diseases. 2. Excess Diet: Excess diet is also hazardous for your brain. It destroys the elasticity of your brain’s blood vessels and thus causes malfunctioning of your brain. 3. Smoking: Smoking is the reason for many fatal diseases. It also affects the brain and can cause Alzheimer’s Disease. Here are some ways to quit smoking! 4. Excess Sugar: Excess sugar is not good for your brain. Some people think that it is beneficial. Yes, but you have to take limited sugar. Excess sugar hampers digestion of protein and ultimately your brain becomes weak. 5. Living in Air Pollution Area: Air pollution hampers brain function by reducing the amount of oxygen needed for our body. So, live in clean air area. Avoid polluted areas. 6. Insomnia: Insomnia means lack of sleep. Your brain needs rest after working all day. If you do not give it rest, it will be weak. Insomnia causes the death of your brain cells. So, try to sleep on time. Do not work for late hours at night. Here are some tips for a sound sleep! 7. Sleeping with the head covered: Many people cover their head with a blanket while sleeping. It is a bad habit and causes serious hazards to your brain. During sleeping, you need oxygen. If you cover your head, excess accumulation of carbon-di-oxide will make your brain weaker. 8. Working during illness: When you are ill, you should not work and pressurize your brain. Give it a rest and you get rid of your illness quickly. 9. Lack of thinking: Your brain is a machine. It should be operated every day. You have to think creatively and differently every day. It keeps your brain in a healthy state. Lack of creative thinking affects your brain in the long run. 10. Remaining Silent: Many people talk so less. It is not a good habit. Your brain gets more working opportunity if you talk and discuss with other people. It keeps your brain functioning which is always beneficial for you. 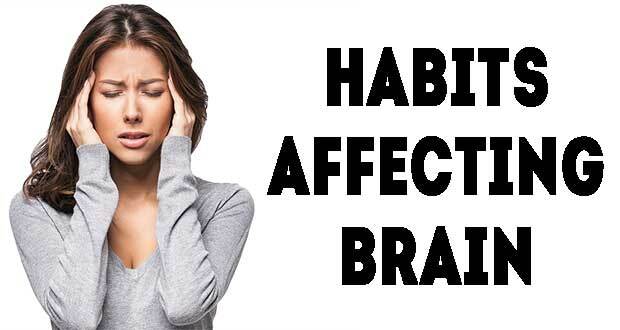 Thank you for reading this article regarding 10 bad habits that can affect your brain slowly seriously.